We design tours across most of the regions within Viet Nam, spanning from the North to the Central and the South, with a variety of transportation modes of air, land and water. Please browse through notable highlights below and give us your ideas. Then we will discuss more in details so we can customize an itinerary which is tailor-made, just for you. Still want MORE… Please watch this! Arrive Ho Chi Minh city, the biggest city and also commercial center of the country. Under French colony, the city was once called Saigon, the ‘Oriental Pearl’, and Paris of Asia. It was also the headquarter of French and American army under the two conflicts. As a result, the city still embraces today a French backdrop in its architectures scattered throughout the place. On the way to city center from the airport, stop at a member of Vietnam National Buddhist Pagodas Association, Vinh Nghiem pagoda, a famous temple that played a significant role for the Vietnamese military during the war. Arrive restaurant for lunch. City tour after lunch with visiting the city’s renowned landmarks : Notre Dame Cathedral and Central Post Office, which both were designed and built by French during their regime, dating back over 100 years ago. Also pay a visit to the Reunification (a.k.a. Independence) Palace, which was formerly named Norodom Palace. During the Vietnam War, the palace acted as the work place of the South Vietnam presidents. This was also where the North Vietnam Army put an end to the Vietnam War, by crushing through its gate with tanks on the historic April 30, 1975. Transfer to hotel, check in, and have dinner. 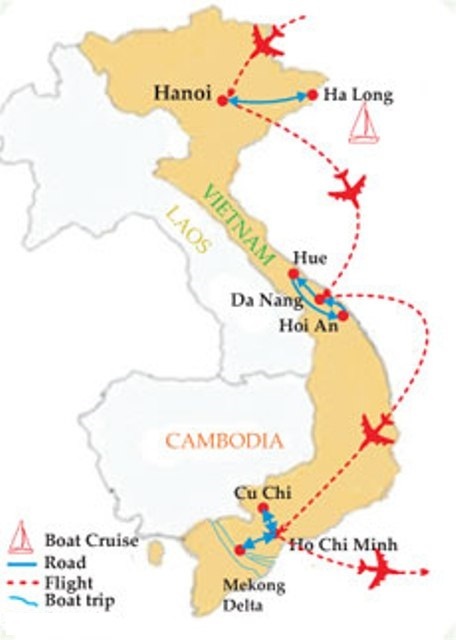 Depart to MY THO, capital of TIEN GIANG province, the first province in Mekong Delta, and also the rice bowl of Vietnam. The region is known for lush vegetation, with plenty kinds of tropical fruit such as jackfruit, watermelon, pineapple, banana, mango, etc. Drop by a temple of Cao Dai, a religion that combines Christianity, Buddhism, and Muslim, with the symbol of an all-seeing eye. Reach TIEN GIANG river, and embark motor boats for Thai Son island. A range of various activities waiting ahead on the island by exploring through countryside roads on foot to witness the authentic lifestyles of the Southerners. These include visiting coconut candy, milky pancake, and honey workshops. Samples are available to try. The sweating walk through the island ends by a small show of Southern traditional folklore music, served with fruits mentioned above, and refreshed with coconut drinks. Return to boats on wooden sampans by rowing through small and peaceful canals with water coconut trees and reeds. Ashore for lunch with two exotic dishes which are deep-fried crispy-skin fish and sweet sticky-rice ball. Head back to HCMc with a stopover in CHO LON, the China Town, to pay a visit to the sacred Thien Hau pagoda, and the oldest Chinese market, Binh Tay, where commodities are traded at wholesale prices. Dinner with traditional dancing performance. Free at night. Visit War Remnants Museum, a place that exhibits evidences of the Vietnam War. After that, visit lacquer-ware workshop to observe the make of one of Vietnam’s popular products. Lunch and free for shopping at downtown department stores Vincom, Parkson, Diamond, i.e. . until late afternoon. Get back on bus and direct to Tan Son Nhut airport to fly to Da Nang, the most vibrant city in central Vietnam, where French colonists fired the first shot. Transfer from airport to the well-known ancient town, Hoi An. This place used to be the international seaport of the nation, several centuries ago. Therefore, a heavy influence of Japanese and Chinese architectural design is found here. Dinner and check in hotel. Bike through Hoi An town to reach Tra Que vegie village, where you will be able to witness the local vegetables within a farming setting. In addition, you will have the opportunity to actually experience the farming and cooking session of making some typical Vietnamese food. The experiment will be ended with a free foot massage in herbal meds. Lunch at Tra Que with lots of green and fresh vegetable from the garden. Browse Hoi An on foot after lunch to check out its attractions : Japanese bridge with a small shrine on it, Chinese temple, ancient houses with some hundreds years old, and so on. Enjoy a short and tranquil boat trip on the Thu Bon river. Traditional tailor shops are located around town for the convenience of cultural souvenirs. Surprisingly enough, purchased tailored dresses are delivered to hotel over night. Dinner is served with special 10-dish local meals. Free at night. Head North to Hue, the ancient imperial citadel and once capital of Vietnam during the reign of Nguyen Dynasty, from 16th to 19th century. Stop at the top of Hai Van mountain pass, the border of Hue and Da Nang province, to observe a picturesque view of sky, mountain and sea. Right at the mountain’s foot is Lang Co fishing village on white sand and surrounded with emerald sea water. Arrive Hue and have lunch. Followed lunch is trip to the Imperial Citadel, where nests the Forbidden City of Nguyen Royalty. The place itself is a World Heritage, although a part of it was destroyed during the American war. It is in reconstruction by fund from UNESCO. Thien Mu (Heaven Goddess) pagoda is the next visit. This resides on the Perfume riverside, and this is where the Nguyen Kings came to pray on the national occasions. The trip finishes with boating back to Hue’s center on the gentle Perfume river. Special treat called Royal Dinner, in which guests will be served with royal dishes in royal outfits. Free after dinner. Visit Tu Duc’s tomb, a king of Nguyen Dynasty, whose tomb is still in good shape after centuries. Stop at incense village on the way. Free to explore, bargain and purchase local merchandise at Dong Ba market afterwards. Lunch is served with delicious ‘Vietnamese crepes’. En route to Hue airport and fly to Hanoi, the second capital of Vietnam since the year 1010, and was named Thang Long (Soaring Dragon) at that time. Dinner at restaurant and check in hotel. An hour tour on 3-wheeled cyclos to discover and explore 36 ancient commercial streets that are named after the goods used to be sold here (i.e : Cotton st., Silk st., Flower st.). Tour around Hoan Kiem (Returning Sword) lake, an iconic symbol of Hanoi with a shrine worshipping the sacred hundred-years-of-age turtle in the middle. Free to shop at Dong Xuan, the signature marketplace of Hanoi. Pay a visit to the first University of Vietnam, Temple of Literature, which was found in 1070. The place churned out top officials during Royal Dynasties. Free to shop at department stores till dinner. Dinner with special seafood hotpot. Afterwards, attend a show of cultural water puppetry. Visit One-Pillar Pagoda, constructed in 1054, that symbolizes a lotus thriving out of a sea of sorrow. After that, walk to Ba Dinh complex nearby where contents: the national Father’s, Ho Chi Minh, mausoleum ; Presidential Palace ; Ba Dinh Square where Independence Declaration was announced in 1954; and Ho Chi Minh’s house on stilts. Lunch with a typical Hanoi meal, Cha Ca (frying fish paste). Hit the road to Hoa Lu, the very first capital of the country from 968 to 1010. Check in hotel and have dinner . Reach river dock to embark on sampans. Stroll through peaceful rivers with water rice fields and magnificent rock formations that make this place an Inland Ha Long bay. Unload sampans and hop on bicycles to a visit Dinh Le temple, built under the first King’s order. Lunch served with local delicacy: mountain goat. Depart to Ha Long and drop by Co Trach shrine, honoring the victory over the Mongolian invasion in the 13th century. Board cruise in Ha Long bay. Experience a cooking session and then enjoy seafood dinner on board. Taichi on board in the early morning and breakfast afterwards. Explore the bay to witness the breathtaking natural beauty of Ha Long (Landing Dragon). The bay is reckoned by UNESCO as a World Heritage, and newly achieved the prestige title, New World Wonder. The boating trip propels through a numerous limestone islets with different shapes and sizes striking out of the emerald water. Unload at Sung Sot (Surprised) cave. The name itself describes the speechless wonder of the cave. Sweat from walking through the cave will be cool down by a refreshing serve with a free swim amid a gentle cove. Back to cruise and have brunch. Return to pier for Hanoi. Stop by Dong Trieu, pottery village, to monitor the method and tradition of making Vietnamese well-known ceramics. Arrive airport. Tour guide assists in checking-in with boarding pass. We hope our presentation excited you and gave you some ideas about what you want to do in Viet Nam at this point. Please feel free to share with us so we can pick up from here. Or if you are still unsure about what you want by now, please do NOT hesitate to let us know. Then we will provide more info so you could be assured to make an informed decision.